In 1953, the Swiss manufacturer Rolex introduced the Submariner, one of the first diving watches in the world. These watches, with rotating bezels, matte black dials, and water resistance up to 100 m (328 ft), are highly coveted collector's items today. The release of the Submariner in 1953 left the watch industry speechless. Rolex had presented an entirely new type of wristwatch that continues to define what we know as diving watches today. The model with the reference number 6204 had luminous oversized second, minute, and hour hands; luminous numerals and indices; and a matte black dial. Next to the first watch sat a small sign that read, "Submariner – the diver's friend". In time, the watch made its way to Hollywood. In the first James Bond movie, Agent 007 is seen wearing a watch with the reference number 6538, now referred to as the "James Bond Sub". The identity of the watches Mr. Bond wore in the other films remains unknown. One exception is the Rolex Submariner with the reference number 5513, which was auctioned off at Christie's in November 2011. Roger Moore wore this model in the 1973 Bond movie Live and Let Die. The series' author, Ian Fleming, only mentions the Rolex Oyster Perpetual once in the entire 14-volume series. Otherwise, he only refers to the watch brand. Since 1995, the spy in Her Majesty's service has opted for models from the Swiss brand Omega. While Steve McQueen was no secret agent, the actor and racecar driver also relied on the sturdy and precise Submariner. In one photograph, he is clearly wearing a watch with the reference number 5512. Revolutionary Che Guevara also wore a Submariner. This watch is so much more than just a diving instrument; it complements everything from racing suits to tuxedos. Looking back at its long history, Rolex holds it to be the archetypal diving watch. How much is a Rolex Submariner? A Submariner No Date costs around 7,900 USD in mint condition and about 7,400 USD pre-owned. The value of never-worn models has risen steadily over the last three years. 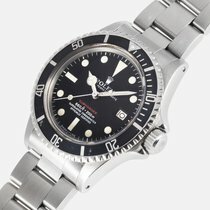 The Submariner Date has a date display and goes for around 9,300 USD in mint condition and almost 8,700 USD pre-owned. Its price has also gone up in the last few years. The green Submariner models are especially popular among collectors. 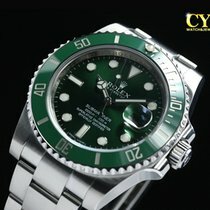 Connoisseurs differentiate between the so-called "Kermit", which has a green bezel and a black dial, and the "Hulk" with a green bezel and dial. The latter is still in production and costs around 11,100 USD. Pre-owned examples are a bit more affordable at 10,300 USD. Since these diving watches are highly coveted, purchases from offline vendors often come with multiple-month wait times. Buying online is quicker, though this also means higher prices. Production of the "Kermit" has already ended, making it much harder to find and more expensive. Be sure to have at least 16,000 USD on hand for a model in mint condition. You can find a pre-owned "Kermit" for around 11,500 USD. Fans of gold watches will also find what they are looking for in the Rolex Submariner collection. This luxury diving watch is available in yellow or white gold. The latter only comes in the so-called "Submariner Blue" with a blue dial and bezel. The yellow gold version is also available with a black bezel and dial. Both yellow gold models cost around 28,800 USD new. At 30,100 USD, the 18-karat white gold version is a bit more expensive. 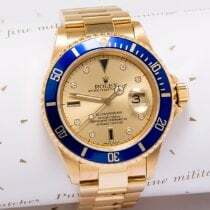 Since gold Rolex watches are generally in lower demand, you can often find them online for several thousand USD less than at retail locations. The bicolor Submariner gives off a real 1980s vibe. You can purchase a never-worn version for around 12,500 USD. Similar to the gold watches, the models in stainless steel and gold are also often less expensive online. Like most vintage Rolex watches, old Submariner models are highly coveted. Two examples of popular reference numbers are the ref. 5512 and the ref. 5513, which were introduced all the way back in the late 1950s and early 1960s, respectively. Even though both models were produced for a number of years, there are currently very few pieces on the market. You can get a ref. 5513 for around 11,700 USD, while you will need about 22,200 USD for a ref. 5512. Examples with the reference numbers 16800 or 168000 from the 1980s are more affordable. You can purchase one of these for between 7,100 and 8,100 USD. Vintage Submariners like the so-called "Red Sub" or the "COMEX" are especially rare and therefore in high demand. Plan to spend at least 16,000 USD for a "Red Sub" and almost 39,500 USD for a "COMEX". That being said, prices vary greatly, meaning you may find a "COMEX" in very good condition that demands over 123,500 USD. Today's Submariner models look almost the same as their predecessors. Over the years, the case has grown and a crown guard was added (1959) to protect the screw-down crown. In 1966, a version with a date indicator joined the collection. Other changes or additions to the watch have been small, such as polished armbands and cases, or blind lugs. Although its design is from the 1950s, the Rolex Submariner remains a modern timepiece. Over time, these automatic watches have progressed to a water resistance of 300 m (984 ft) and feature rotating, scratch-resistant Cerachrom bezels with 120 clicks. The bezel can only be turned clockwise, which is a requirement for all modern diving watches. The bezel insert is made of Cerachrom ceramic, which is a particularly scratch-resistant material. The zero marker, as well as the hour markers, are filled with the luminous material Chromalight. They glow blue and are more luminous than SuperLuminova, the material typically used in watches. Furthermore, the watchmakers have added platinum dusting to the numbers and indexes on the bezel. The hands are domed and made of gold, as are the index markers on the dial. Aside from the hour and minute hands, the second hand also has a luminous spot. Compared to earlier models, the sapphire glass barely sticks out, protecting it from jolts. In total, the stainless steel Submariner weighs 150 g (0.33 lbs). The backside of the case, the bracelet, and the inner side of the fold-over clasp are all smooth. The Glidelock clasp adjusts the size of the bracelet in 2 mm increments and is slightly larger than in previous versions. Therefore, the watch can be worn directly on the wrist, as well as over diving suits. The clasp features a safety catch, ensuring it can't be opened accidentally. The Submariner with a Cyclops lens date indicator is run by the caliber 3135. The manufacturer has produced this caliber in Biel since 1989. It was designed to be a robust, highly accurate movement and is protected by a stainless steel case back; however, it still offers aesthetically pleasing details. The red aluminum crown wheel and the blue Parachrom hairspring stand out the most, while the sunburst on the winding rotor and the automatic bridge are more subtle. Models without a date indicator are powered by the caliber 3130. Both movements are classified as chronographs, seeing as they've passed the tests of the Contrôle Officiel Suisse des Chronomètres (Official Swiss Chronometer Testing Institute). Both calibers are considered to be among the best in the watchmaking scene. Rolex optimized important components, such as the balance spring, thereby improving the overall accuracy of their watches. They achieved this by using an anti-magnetic alloy, which prevents the watch from being affected by magnetic fields. The special Breguet spiral allows the balance spring to "breathe" and improves its precision. Master watchmaker Abraham-Louis Breguet introduced this improvement to the balance spring in 1795. He raised its last coil, thereby reducing the curvature. The caliber is regulated by Microstella nuts, which are located on the inner side of the balance wheel. Unlike most mechanical movements, the watch is not adjusted using a regulator, but rather via the Microstella system. Some Rolex watches make collectors' hearts beat faster. The so-called "Red Sub" is one such highly sought-after collectible. Rolex produced the Submariner with reference number 1680 between 1967 and 1980. The name "Submariner" was written in red on the dial until 1974, thus earning it the nickname "Red Sub." One can distinguish a real Red Sub from a fake by examining the dial. Between 1967 and 1974, Rolex used six different dials, which were labeled Mark I to Mark VI. The biggest change occurred between Mark III and Mark IV. Experts call the Mark I to Mark III dials "meters first," because "200 m = 660 ft" is written on the dial. Beginning with Mark IV, the dials are known as "feet first," because the meter and feet measurements switch places. Mark I dials are the rarest versions of the Red Sub. They can be recognized by the closed sixes in "660 ft."
Further distinctive features include the tropical dials that appear on the Mark II and Mark III. Due to exposure to direct sunlight, humidity, and heat over the years, the color of the dial and the bezel changed to brown. This most likely occurred due to a special color mixture used at the time by their supplier. These tropical dials are highly prized among collectors and increase in value with the intensity of the color change from white to yellow or brown. However, the color of the hands and indexes should be the same, as that is a sign of a true Rolex. When buying a "red" Submariner, it's also important that the reference and serial numbers are readable. The manufacture date is also on the case back of earlier models and corresponds to the serial number. Bold type numbers and indexes on the bezel indicate a genuine red Submariner. Later versions feature a thinner typeface. It is less important if there is a missing or damaged luminous point at the zero marker. These vintage Submariners are powered by the automatic movement 1575, which also has a date indicator, unlike the 1570. The 1575 caliber also runs the Sea-Dweller with reference number 1665 and the GMT-Master with reference number 1675. The Submariner has gone down in watchmaking history over the last six decades. 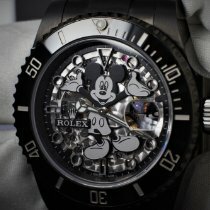 It has developed into an icon and one of the most well-known watches in existence. The special Deepsea Challenge model even went to an impressive depth of nearly 12,000 m (39,370 ft) in the Mariana Trench in 2012 – the world record for a watch. The predecessor of the first Submariner, reference number 6200, was water resistant up to 100 m (328 m) thanks to its distinctive Twinlock crown. It had a bi-directional bezel that allowed divers to keep track of the length of their dive quickly and easily with just one glance. The Swiss watch manufacturer Blancpain improved this bezel in 1953 with their Fifty Fathoms model. Its bezel is unidirectional, meaning it can only be turned clockwise and therefore the dive time can only be shortened and never lengthened. Rolex took the advice of René-Paul Jeanneret when designing the Submariner. 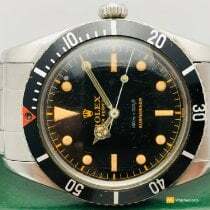 The former Rolex director was an avid recreational diver and gave helpful suggestions for the dial, bezel, and case. The watch survived various tests and 132 dives to depths between 12 and 60 m (39 to 197 ft). It even fell on a concrete dock from a height of two meters and continued to function. The only damage was the loss of a small part of the luminous material from one of the hands. The successor of the original Submariner was water resistant up to 200 m (656 ft) and was the official watch of the British, Australian, and Canadian marines. The year of 1953 was a special one for the watchmaking industry overall. In August of that year, New Zealander Sir Edmund P. Hillary and the Sherpa Tenzing Norgay were the first men to reach the summit of Mt. Everest. An Oyster Perpetual from Rolex was with them on top of the mountain. Rolex had sponsored the expedition led by Colonel Sir John Hunt. The automatic watches were not simply gifts for the mountain climbers, they had been sent along in order to test their reliability and strength under harsh conditions. Sir Hillary sent his watch back to Geneva after the expedition with notes. Countless tests led to the creation of the Rolex Explorer, a watch for adventurers.